I know I am not the only one who deals with cracked heels a few times a year, especially during the cooler months. I am pretty much always barefoot, so it can get embarrassing if someone decides to glance down at my feet. Okay, so that has never happened to me before, but still, I want my feet to look nice and pretty from heel to toe. I do use an electric callus roller a few times a month, but that's not the only thing that cn keep them looking their best. I've tried rubbing lotions and oils on my feet, but these joint seem to penetrate my skin and treat the problem well. I only recently started using two products by Zim's and they both work nicely. 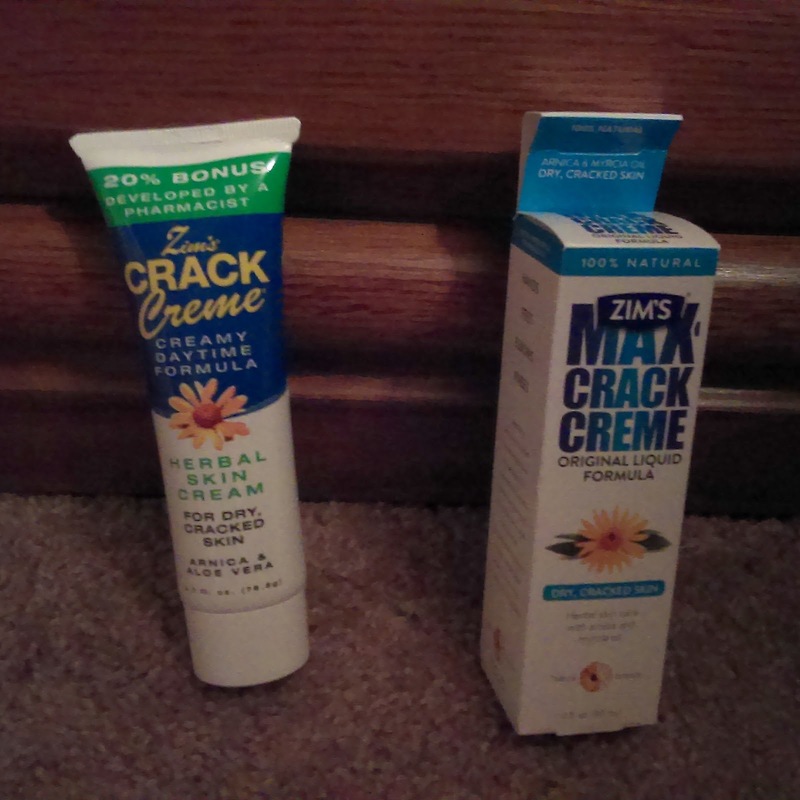 One product is called Zim's Max-Crack Creme Creamy Daytime Formula, which I use in the morning and sometimes a touch up during the day. The other product is called Zim's Max-Crack Creme Original Liquid Formula, which I like to apply right before I go to bed, and then put on a pair of thick socks. I am not joking when I tell you that in only two days I noticed a really big difference in how my whole foot on each side looked and felt. They started out dry, flaky-heeled, and rough. The end result was soft, smooth, and somewhat minty scented. If only I had known about this stuff when I was pregnant. It seemed like my feet were even more dried out during that time. The nice thing about both of these products is that they can also be used on other dry areas, such a knees, elbows, cuticles. Now, I can have soft skin all over. They have natural ingredients, including arnica and aloe. Would you like to try and win your own set? If not for yourself, it would be a nice little gift to give to someone you know who could use it. Enter the free giveaway below for your chance! There will be 2 winners, Must be 18+ and live in the U.S.
Disclaimer: ZimsUSA is responsible for prize fulfillment. I received this product in exchange for my unbiased review.